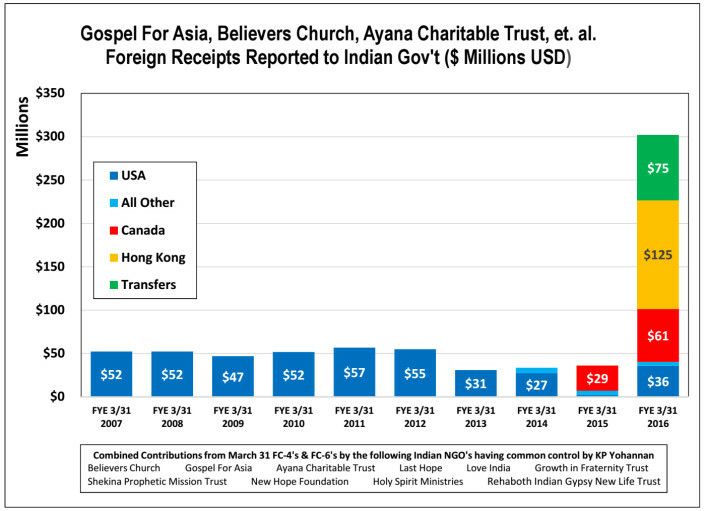 As you can see from these figures reported as income into India in 2016, unlike every other year GFA reported to its donors, 2016 was a banner year with a significant increase in funds. Hauling in approx. 300 Million into India. From banks in places like Hong Kong – amazing! Other years never brought in quite that much. KP Yohannan and the Believers Eastern Church should now be able to really go out and Reach the Most Unreached in an unprecendented way with 300 Million. We who hold missions dear can’t wait to hear what is being done with the 300 Million to go out and reach those who have never heard of Jesus. Imagine how many missionaries and children can now be sponsored! The reports of explosive growth in sponsorship should be good to hear about. Just imagine what can be done with 300 Million, because it’s so inexpensive to support native missionares! See GFA, there seems to be many names reporting funds under one umbrella, do some basic math. KP Yohannan and his Carmel College of Engineering. Financial issues as reported by The Hindu.